this was my second time making baklava, first time making his recipe. the directions were easy and the result was amazing! So. Hubbs is the big 35! And to celebrate, I made him a feast of his heritage. Although I know I didn't quite do Tete Yovanka justice, I tried as best I could. And here's how I did it. I used blogs and the Bulgarian cookbook hubbs' parents got for us to make these. 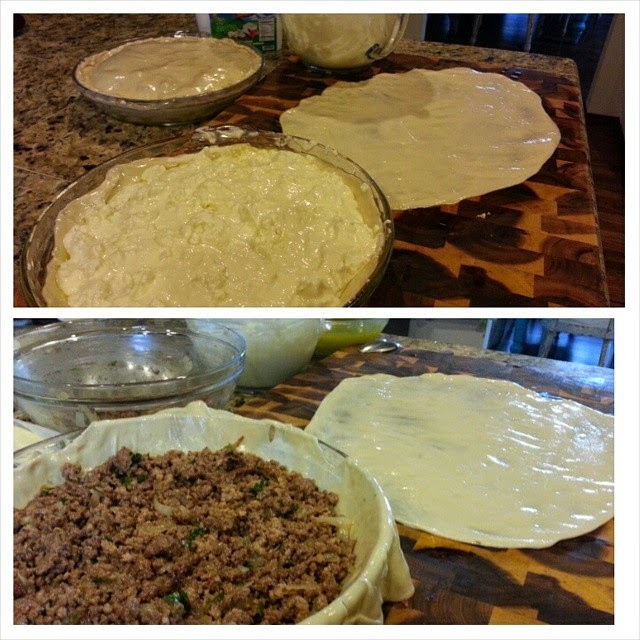 For starters, to make my own phyllo dough, I used this blog. There is a Bulgarian dish called Bonitza that is very similar to burek, but I think the dough is thicker. Which is why I made my own. 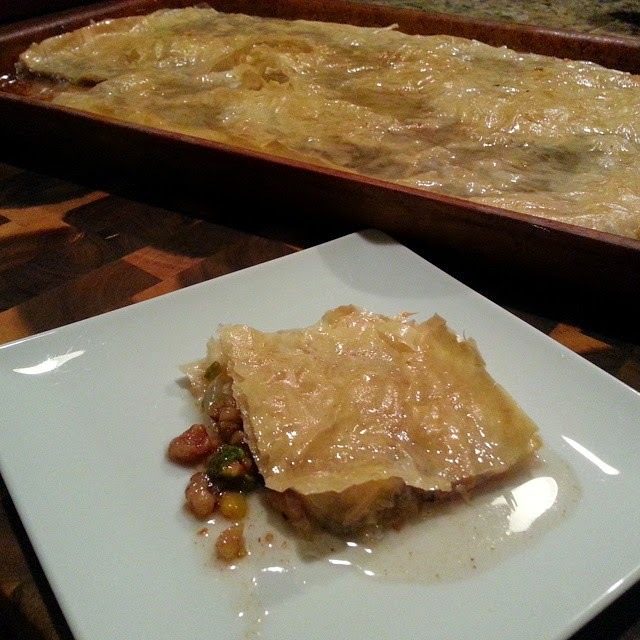 (I cheated for the baklava and used frozen, organic phyllo dough). I don't use this blog's filling because it's not how his aunt makes it. And feta > cottage cheese any day of the week. I cooked the meat, onion and parsley. remove from heat then add the egg. 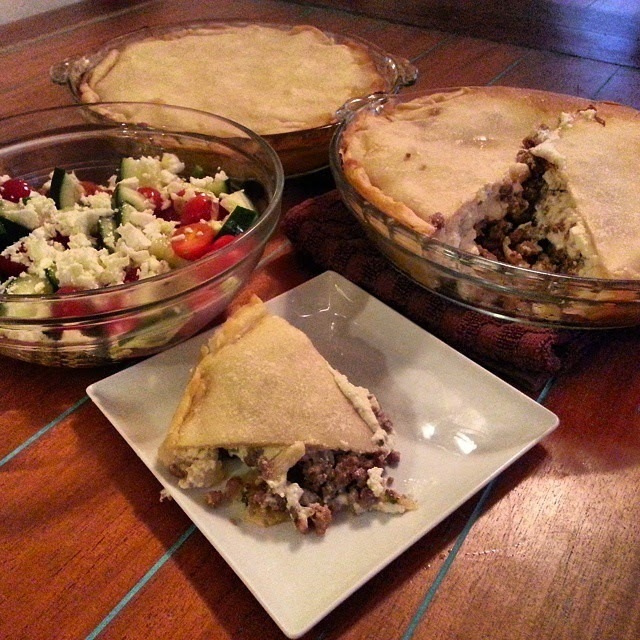 the cheese filling is just 1 lb feta (Bulgarian sheeps milk feta is the best, but French feta is a close second. Greek feta is not creamy enough). Then, you follow the directions from the blog as far as shaping and filling the dough. Do fold the dough over each layer. I did not do that and there was not nearly enough dough in the pie for all that meat and cheese. I made one layer meat, the other layer cheese, with a teeny bit of meat sprinkled on top. In the cheese pie, the filling is a bit different. I added a cup of yogurt to it. And another 1/4 pound of cheese. As I said, make sure you fold the dough over the layer instead of leaving it hanging over the side like I did. Then follow the baking instructions from the blog. Once it's done cooking, cover it with a kitchen towel while it sets...hubbs' said that's how you keep the top soft. And now for the Baklava. I had to get creative since I didn't have enough walnuts, so we used half walnuts and half pistachios, which is actually quite delicious. And I thought that there was honey in it, but the Bulgarian calls for a sugar lemon syrup which you make instead of honey. Still delicious. 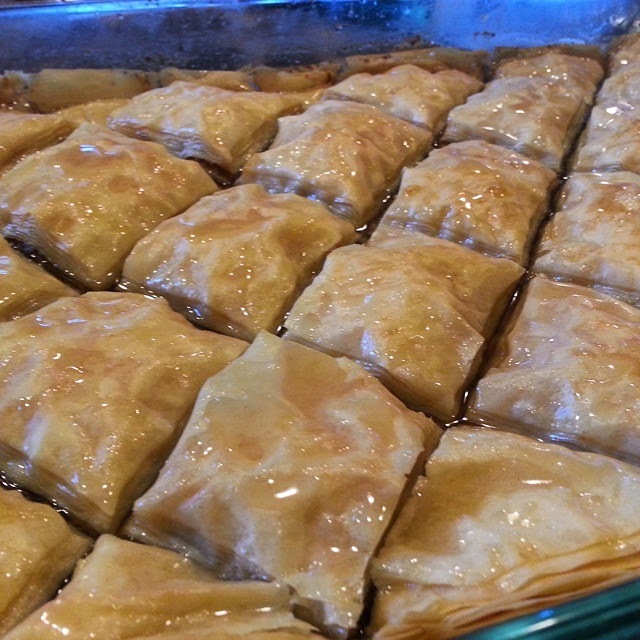 You will need six sheets of phyllo dough if you only want one layer, which is what the recipe calls for, but I'm sure you could double it easily. make the syrup by bringing sugar and 1 1/2 cups of water to a boil and cook for 10 minutes. turn off heat, then cool and add lemon juice, to taste. let cool. cover with the next 3 sheets, spreading melted butter on each one. Bake at 400 degrees until top is golden brown. Remove from oven and pour syrup over the top. Let it stand for 24 hours to soak. I of course could not wait 24 hours to try it. So I had some and it was still delish. But I'm looking forward to my piece tonight that's been soaking!